Beautifully updated 1 bed/1 bath ground floor condo in Foxdale Condominiums. Fresh paint and brand new laminate flooring through out w/ new carpet in bedroom. Living room features incredible fireplace w/ stone from floor to ceiling! 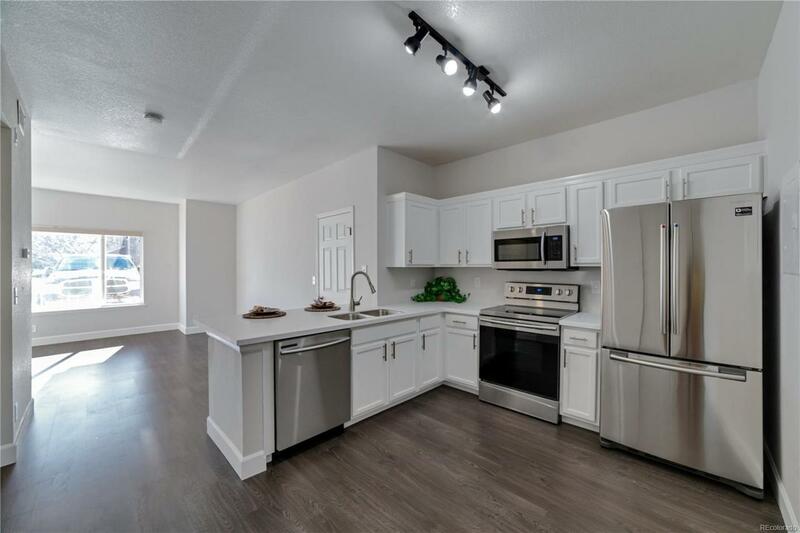 Kitchen has brand new stainless steel appliances and large corian countertop w/ eating space - and features a large pantry. Spacious bedroom has a large walk in closet. Bathroom is roomy w/ new vanity and other updates. Washer and dryer are included. This condo includes a rare detached 1 car garage! Easy access to condo w/ no stairs and just a few steps from reserved parking spot directly in front. Condo faces south for that beautiful natural light to shine through. Plenty of storage- oversized interior coat closet, front patio area features an exterior closet, and of course the 1 car garage. Low monthly HOA includes access to pool, fitness room, clubhouse, tennis, exterior maintenance w/ roof, water/sewer, trash removal & snow removal. A MUST SEE!